Holidays are taken very seriously in Donbass capital. And considering the fact that the City Day of Donetsk is held at the same day as the Miner’s Day, the level of all the festive events is double high. This year the President of Ukraine was personally present at the celebration of veterans of miner’s work in Donetsk that took place on the 28th of August. We can say that Viktor Andreevich respects blacksmiths as much as miners. 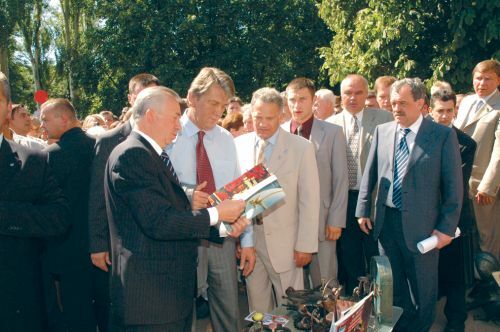 That’s why he visited the 7th All-Ukrainian the Forged Figures Park-2005 Festival of blacksmiths art the same day. New works by the best blacksmiths-artists in Ukraine and the competitive spirit of the 1st Ukrainian blacksmiths all-round events championship impressed greatly not only the President but also all the festival participants and audience. The Forged Figures Park-2005 Festival became one of the most entertainment centres of the Donetsk Roses grand show. Not only festival organizers The Magazine of Metal and the Ukrainian Gefest blacksmiths enterprise should be thanked for this. The festival was hold on the highest level due to comprehensive support of Aleksandr Lukianchenko, the city mayor of Donetsk, to the generous sponsors and above all, to the festival participants – the best masters of blacksmiths art in Ukraine. Wonderful Zodiak Signs Alley, created by joint efforts of blacksmiths from Donetsk, Kiev, Ivano-Frankovsk and Aleksandria (Kirovograd region), is a bright evidence of this. August, 27. Saturday. Twenty of forty visitors of the All-Ukrainian blacksmiths conference from different parts of Ukraine were put up in the Shahter Hotel at the expense of the Donetsk City Council. Some of them stayed at the Spanish Yard Hotel. At 4 p.m. all the delegates gathered in the specially mounted roomy tent and the conference was started. Harmony and unanimity may be the words to describe the creative atmosphere of the conference, as there gathered not only representatives of the most respected from the ancient times man’s occupation but also people holding the same views, brothers in faith, servants of the god of fire and blacksmithing. The place of the conference holding was also carefully chosen. The delegates met in the park behind the building of the City Council, among the trees and amazing forged figures. The conference organizers succeeded to create the aura and mood of the nature’s lap in the very heart of megapolis. Not all the conference participants had a possibility to visit exhibitions and festivals organized by blacksmiths from different parts of Ukraine in 2005. But all these events were in their own way unique, that’s why presentations of their organizers with the demonstration of pictures on cinema screen were lively discussed. Mihail Klochko refreshed the audience’s memory of the events in Ivano-Frankovsk where the Ornamental Smithery festival took place at the beginning of May. Everybody agreed that the level of the works presented there enabled Ukrainian masters to compete confidently with the best schools of Europe. Vladimir Demin, the chairman of the Kiev department of the UMBAU and Oleg Krivoruchenko, the chairman of the Crimean department made reports on the Kiev exhibition in the Mystets gallery and on the festival in Sudak. Visitors of these events and the mass media highly praised the quality of the forged works by blacksmiths of our country. My and Victor Burduk’s reports on meeting with European blacksmiths in the Czech Namest castle nad Oslava drew a lot of attention. The detailed reportage of this event was published in the back issue of the The Magazine of Metal. Europe warmly welcomed our masters of blacksmiths art. On the day of the conference the chairman of UMBAU Sergey Polubotko wasn’t in Donetsk. He represented Ukraine at the festival in the Helfstyn Castle and greeted his Ukrainian colleagues from Czech Republic by phone. August, 27. Sunday. The people in armour have become quite usual for Donetsk festivals. Everybody was also moved by dancing horses of the Tatarsal company. They got a round of applause. The guests of honour made a short tour of the Zodiac Signs Alley after the traditional red ribbon cutting. The festival programme began right after the flag of the Ukrainian Gefest blacksmiths enterprise and at the same time the flag of the 1st Ukrainian blacksmiths all-round events championship had been run up above the stage. 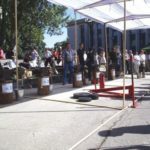 The concert had been going for four hours along with the blacksmiths competition hosted by Victor Burduk who introduced all the participants and competition results. All the concert numbers, contests with interesting comments had compelled the audience attention to the most grandiose blacksmiths fest in Ukraine for six hours running. 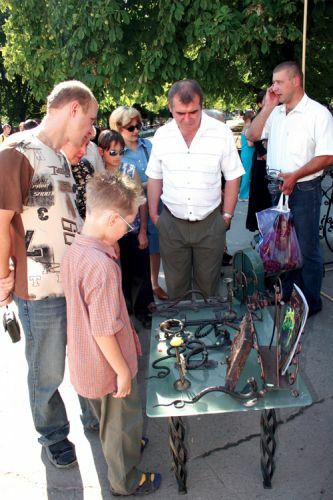 Starting from the year 2004 the all-Ukrainian blacksmiths festival takes place in the Forged Figures Park. The Sweethearts Pavilion was created and decorated with bunches of flowers forged by joint efforts of great number of Ukrainian masters of blacksmiths art. In 2005 the Zodiac Signs Alley was the most important sculpture complex placed in the Forged Figures Park in Donetsk. The idea of creating this Alley belonged to Victor Burduk and its implementation was financially supported by the Donetsk City Council. Seven of twelve forged artworks of the Alley were made by masters of the Ukrainian Gefest blacksmiths enterprise. Two more sculptures – The Aries and The Aquarius – were produced by blacksmiths of the Donetsk Opal and Prolisok companies. The Cancer sculpture is an artwork of blacksmiths of the Kiev Tantiema art blacksmithing plant. The manager of this enterprise Aleksey Yurchenko told us his masters used a crayfish as a model. They took it apart and forged each part separately. Then all the produced parts were assembled into a sculpture, packed and sent to Donetsk as a present. Some of the Zodiak Signs Alley visitors say, ‘We have a strong desire to boil this crayfish in some hot whirlpool and eat it!’ Others think, ‘This Cancer is a person! It is alive and friendly’. The Pisces is presented to the city by the masters form Aleksandria (Kirovograd region). According to the author’s message this special work of the Renessans private enterprise has neither welds nor coating. It is made with the implementation of ancient methods. There is some charm in it. 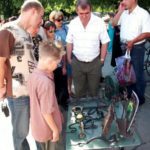 It should be pointed out that The Scorpio sculpture had been forged for two weeks by the general director of the Ukrainian Gefest blacksmiths enterprise Victor Burduk during the breaks in his work. The Lion is made by Yevgeniy Yermak, the chief blacksmiths of the same enterprise. Both sculptures are also produced without any welds and with the implementation of ancient blacksmiths methods that demonstrates the skill of these masters. The founder of the 1st All-Ukrainian blacksmiths all-round events championship the Ukrainian Gefest blacksmiths enterprise and its organizer The Magazine of Metal aimed to popularize blacksmithing as a kind of decorative and applied arts, promote blacksmithing, demonstrate different blacksmiths methods and improve blacksmiths art image. Famous masters of blacksmithing from different parts of Ukraine were invited to take part in the championship. There were eight of them: Vladimir Grinchyshyn (Ivano-Froankovsk), Sergey Groshenko and Sergey Kravets (Kharkov), Sergey Firsov (Kiev), Andrey Lysenko (Aleksandria), Yevgeniy Yermak (Donetsk), Anatoliy Lednev and Igor Romashenko (Simferopol). We are also very grateful to the following partners of the festival: the general promoter Ukraina broadcasting company, the Kremen insurance company, the Leman Ukraina company, the Byttechnika distribution network, the 100% trademark, the Donsplav company, the Spanish Yard (Ispanskiy Dvorik) hotel-restaurant and the Classnoe Radio promoter. Thanks to the allocated funds Donetsk impressed festival guests with its hospitality again and everybody who had participated in that blacksmiths event was awarded with energy of creation and unforgettable memories. 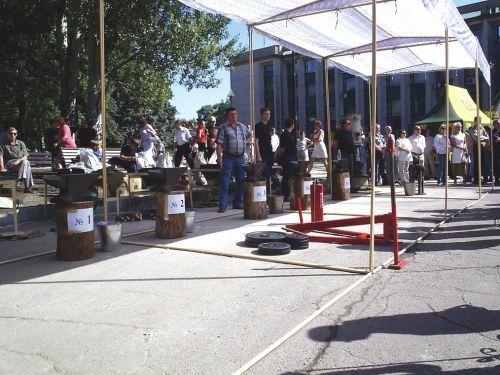 Owing to the support of festival sponsors the 100% and the Mernaya trade marks, as well as the general sponsor the Kremen insurance company all the championship participants were provided with the same material and equipment for blacksmiths exercises performance: a furnace, an anvil, chark and material for ignition. Moreover, the Mirgorodska TM, the 100% TM, and the Spanish Yard Hotel provided perfect food and drinks for the festival participants. And our general sponsor the Kremen company insured each participant for 10,000 grivnas (2,000$) against some traumas in course of the championship. Fortunately, in spite of the competition ardour and difficult championship conditions the insurance certificates were not used. The competition began with the demonstration of the skills to light the fire in the furnace quickly and in a right way. Criterion of estimation is the time when the first sparkles from the work piece in the furnace appear. Being a show, the championship had also quite large prize money and competent jury headed by Mikhail Klochko (Ivano-Frankovsk), the chairman of the check-up committee of the Union of blacksmiths of Ukraine. Не was actively assisted by Oleg Krivoruchenko (Simferopol), Vyacheslav Samofalov (Kiev), Andrey Chepirdak (Vinnitsa region), and Igor Shapoval (Aleksandria). Donetsk championship know-how was that each of its seven exercises had clear criteria for objective estimation. So, the results did not depend on subjective opinions and disagreement of the jury. And it really worked. Otherwise, there would be no such an unpredictable championship final. The second heptathlon exercise was the elongation of the work piece with the hammer at one heating. It demonstrated blacksmith’s power of impact, accuracy of movements and stamina. Criterion of estimation was the length of the prolonged work piece measured with a special ruler. The third exercise was the twisting of the work piece end into a disk. It had to be done at one heating as well. Yevgeniy Yermak managed to make the disk with the greatest diameter of 67 mm. This result consolidated his leading position as he won three first exercises. The organizers found quite interesting way to estimate the fifth exercise – production of a ring out of the 314 mm long and 16 mm in diameter rod on the beak with a hammer. Special measuring cone was prepared. The better a ring was the lower it could be forced on the cone! This time the winner was Sergey Goroshenko. Anatoliy Lednev and Andrey Lysenko both got the second place. The sixth exercise was the blacksmith welding. It demonstrates master’s ability in joining steel work pieces via an ancient blacksmith method. Each participant had to weld ring ends via technology of manual blacksmiths welding. The winner was defined with the special dynamometer machine that could tear the weld and measure the effort applied. Perhaps, the development of this machine was the most difficult task for the engineers of the Ukrainian Gefest blacksmiths enterprise during their preparation for the championship! With the result effort of 1,35 t Sergey Groshenko won. Anatoliy Lednev got the second place in the fifth and sixth exercises. By that time he was a leader of the championship being three points ahead Yevgeniy Yermak. The last exercise had to define the winner. It was about blacksmiths’ skills in working accurately with the pneumatic hammer. Participants had to jump a 22 mm long rod and forge out of it a hexagon nut work piece for the nut key № 46. The most important about this exercise were speed and accuracy of work. Vladimir Grinchishin was the best at this exercise. Owing to the fact that he had performed well in the previous exercises (second, fifth and third places), he got the third place at the championship. Yevgeniy Yermak won the second place at this exercise. The final results surprised the jury as well as the championship organizers. 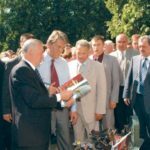 The planned prize money – 4000 grivnas for the first place, 2000 grivnas for the second place and 1000 grivnas for the third place — had to be redistributed urgently. The first place was divided as the jury proved two masters had the right to hold the title of the best blacksmith of Ukraine. They were Yevgeniy Yermak and Anatoliy Lednev. Each of them got 50 points. It was decided to present both winners with 3 000 grivnas (600$) and leave the 2nd place unoccupied. Famous medalist from Dnepropetrovsk Yevgeniy Troshev had to make one more medal for the 1st place as the medal for the 2nd place was left in the archives of The Magazine of Metal.